To Enquire Click Here or on Image Below ! For The Gallery Click Here ! 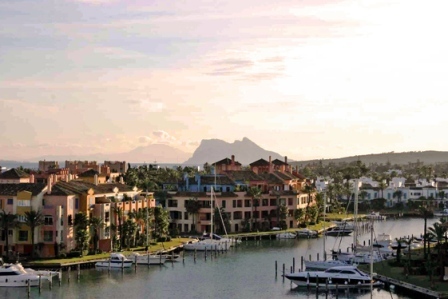 This new development of Luxury Apartments in Sotogrande are located in the heart of the marina complex. The apartments themselves are built and furnished to the highest levels imaginable, with added features such as access to private indoor heated swimming pools, jacuzzi's and saunas. Each of the apartments also have fantastic panoramic views out to Gibraltar and Morroco beyond. These apartments in the "Ribera del Marlin" offer than you can possibly imagine, with an excellent location in the Marina complimented by a spectacular overall architectural design. Not to mention the private gymnasium. This exclusive development also has lush gardens, a heated large indoor pool, outdoor swimming pools as well as generous interior floor space and terracing with views of the Mediterranean and the Sotogrande Marina. "Ribera del Marlin" offers exclusive residential apartments in a landscaped gated community with 24h surveillance.